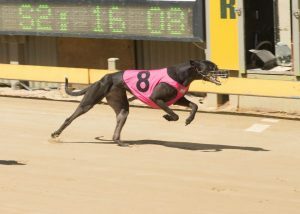 At Gawler greyhounds on Friday afternoon, Lewiston trainer Kevin Bewley was the only trainer to go home with a double. Kevin’s first winner came in race 3. Shot Thru, Starting from box 8, Shot Thru had been caught out wide before settling midfield, but continued to run on and finally overpower the leader, Play That Song (2), in the 531m event. Play That Song, who went down by just ¾ length, is trained by Ken Trowbridge at Park Holme, and Menzies (6) came from last to finish third for Stuart Ellis of O’Sullivan Beach. The next race on the program, also over the 531m trip, provided Kevin with his second winner. This came through the success of McIvor Neville, who in jumping from box 6, had completely missed the start, and was still tailed off mid race by about seven lengths from the leader. However with a determined run from the rear, McIvor Neville was able to switch from the outside and take a rails run on the home turn to win by just over a length on the line. Second placing went to Unique Edition (2) for Tim Richards of Meningie, with Blue Wolf third for Steven Brook of Lewiston. McIvor Neville is owned by Kevin, while Shot Thru is owned by ex- SANFL footballer, Clinton Alleway. Ben Rawlings had a win with his promising new runner, Ed TheExpert. The win came in a Grade 6 event, over the 400m journey, which saw Ed The Expert (5) go straight to the front, to lead all the way and score in untroubled fashion, in a good time of 22.01 secs. Second was Notorious Jiggs (2) for Nathan Hughes of Lewiston, and third was Youlia (1) for Angela Modra of Gawler River. Ed The Expert now has the good result of two wins from just three starts, all at Gawler. Racing is held at Gawler every Friday and Tuesday afternoon, and a Sunday night meeting will be conducted on 31st March, in lieu of Friday 29th. The public is always welcome to join us any race day for great racing action and a meal.